Ford said the partnership will bring self-driving vehicles to mainstream consumers. The carmaker said the partnership would team its experience with autonomous vehicle technology development and large scale manufacturing and Lyft’s customer network to bring self-driving vehicles “to the masses”. The alliance will see the firms work on creating a technology platform that can easily connect with a partner’s platform to effectively dispatch a self-driving vehicle. The work will also include analysing which cities to work with to deliver a self-driving vehicle service – no timelines have been announced. Other firms that have already partnered with Lyft include GM and Jaguar Land Rover. 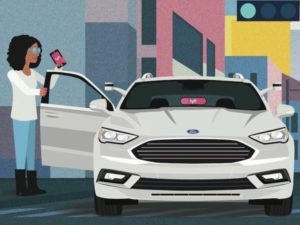 Earlier this year the ride hailing firm also announced that it was teaming up with nuTonomy, a developer of self-driving car software, to run a trial on self-driving electric cars in the US, and it also partnered with Waymo, Alphabet’s self-driving car company, on new self-driving products.For more of the latest industry news, click here.